Ethical behaviour in teaching and learning, particularly in online learning environments, has been very much on my radar this year – or I should say unethical behaviour. I am not alone in my concerns. I notice that in my Evernote Notebook on ethics, the number of links to articles expressing concerns about ethical behaviours online is growing. Looking back I notice that my interest in ethics went up quite a few notches as a result of my involvement with the Rhizo14 MOOC, which I subsequently began to research collaboratively with my friends/colleagues Frances Bell and Mariana Funes. When we started this research we were concerned about how to deal ethically with the data we were collecting and shared our thoughts with Rhizo14 participants, before determining how we would approach this. My Evernote Notebook has quite a few references to Ethics Guides (e.g. the Association of Internet Researchers’ Guides ) and I note a post by Martin Weller on the Ethics of Digital Scholarship. But my concerns go beyond ethics in researcher practice to ethics in teaching and learning, particularly on the open web. An article that I picked up this week by Max Bazerman bears the title ‘You are not as Ethical as you Think‘ and outlines many of our blind spots in relation to ethical infractions which he believes are ‘rooted in the intricacies of human psychology rather than integrity’. This is interesting, but I think we need to go further if we are to understand and counter unethical behaviour. Also this week my friend and research colleague Carmen Tschofen, sent me a video in which Dan Currell talks about unethical behaviours and misconduct in the workplace. Carmen and I ‘met’ in CCK08, the first connectivst MOOC about connectivism convened by Stephen Downes and George Siemens. In the paper that we collaborated on as a result of our CCK08 experience we explored the meaning of individual and psychological diversity within connective environments and were aware of some of the concerns raised by Dan Currell in his video. Currell’s video not only identifies how we can recognise unethical behaviour when it occurs, but also provides a picture of what ethical behaviour might look like – and unlike research ethical guidelines he is not talking about policies, rules and regulations. The title of Dan Currell’s talk doesn’t pull any punches. He asks straight out ‘Why are people such jerks?’ defining jerks as people who behave badly or unethically. Although his talk is aimed at an audience of businessmen and women, I could easily relate it to educational settings, although I don’t think the word ‘jerks’ would go down too well in educational settings. It might promote even more unethical behavior and confrontation rather than working towards solutions. It is contextual – the same children are not always ‘jerks’ – it depends on the circumstances. In his research Currell conducted surveys in 150 organisations with about a million people to explore the cultural conditions which lead to misconduct or unethical behavior. As a result of this he identified indicators of what a good workplace looks like, and I would suggest, what a good educational experience looks like. Comfort in speaking up. If people are uncomfortable about speaking up, then the rate at which others behave like ‘jerks’ is higher and the rate at which people report it is lower. Organisational justice (i.e. employees – or in educational settings, learners – believe that the organization will do something about unethical behavior). These indicators have been identified from both quantitative and qualitative data suggesting that ‘bad behaviour’ cannot be simply a matter of individual perception. No confidence or belief that the organisation will do anything about it. These two reasons for silence also exist in online learning environments, but online unethical behaviour not only silences people for fear of retaliation, but also causes them to walk away which is not so easy to do in an organisational setting. This makes it much more difficult to address online unethical behaviours. So what can we do about unethical behaviour? Currell provides a long list of possible actions in his video, but highlights 4 as being very important. Unpacking what a million people told us about misconduct, harassment, bullying and enforced silence in the workplace. Punchline: there are a few keys to an environment that fosters and multiplies jerks, and those keys can be identified and fixed. Currell has identified keys and possible actions which could counter unethical behaviour, which is a definite advance on simply making a subjective judgement about whether a behaviour is ethical or non-ethical. But my sense is that there is further work to be done on identifying the role and responsibilities of leaders (teachers) and in particular in acknowledging the power they hold and how that might enable or disable ‘comfort in speaking up’ and the other characteristics of an ethical working/learning environment. I spent most of yesterday in my garden, thinking about plants and how what I was doing in my garden might relate to my understanding of teaching and learning in open learning environments. We have a large garden – ¾ of an acre. Over the years we have tried to organise the garden so that it is manageable. There is no way I can keep on top of it, even with help, and to be honest, much as I love my garden, and in particular the privacy it affords, gardening is not my first priority. The garden is too big for me to know what is going on everywhere and too big for me to manage all the plants. This is what one part of the garden looks like at the moment. Today I thought I would split some of the perennial plants and move them to fill up other gaps in the garden – such as the red and pink border plant (polygonum affine) you can see in the photo. But instead I found I spent my time thinking about dominant plants and how to deal with them, particularly Aquilegia, a deceivingly delicate, informal, pretty plant. This year it has been all over our garden. I don’t remember ever planting Aquilegia in the 30+ years we have been living here. It seeds itself and pops up everywhere. But the problem is that it then, with its bushy leaf growth smothers every smaller plant around it and can crowd out even slightly larger plants. In other words it dominates and because it propagates itself, it is very easy, if you are not paying attention to your garden, to lose some lovely plants which it sits on top of. 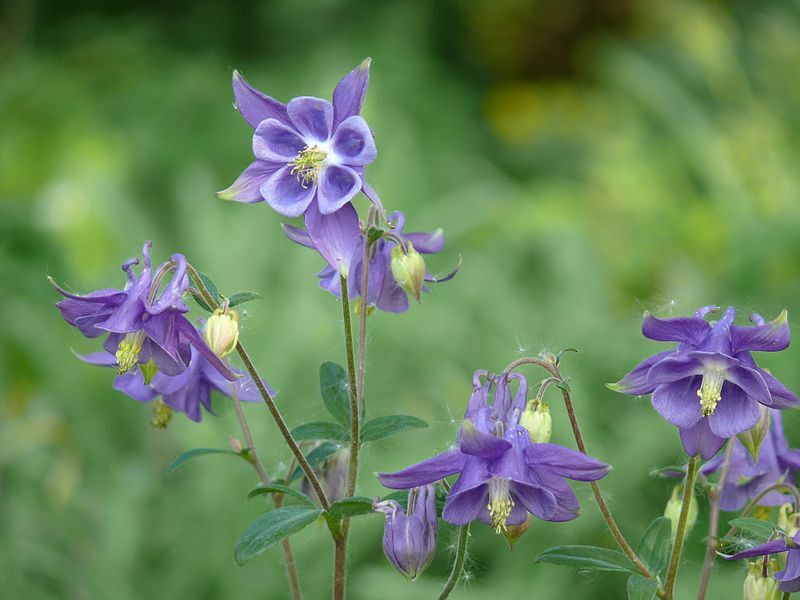 Aquilegia is the type of plant that is difficult to contain. It is everywhere. It is too much ‘in your face’! I spent much of yesterday either digging it up or moving other plants away from it. The other plant I had to think about yesterday was Ground Elder. This is another plant which is everywhere is my garden. It is the worst kind of rhizome. What I really dislike about this plant, apart from the fact that it is almost impossible to eradicate, is that it springs up in the middle of another plant where it is definitely not wanted. This year I have had to constantly pick it out of the middle of my Hostas. To remove it completely from the Hostas, I would have to dig them up too. Some plants seem to manage to seed themselves (or the birds seed them) and then grow into a self-contained shrub without causing too much bother to the other plants around them. An example of this that I really like in my garden and which is looking particularly lovely at this time of year is ‘sweet amber’ (hypericum androsaemum). 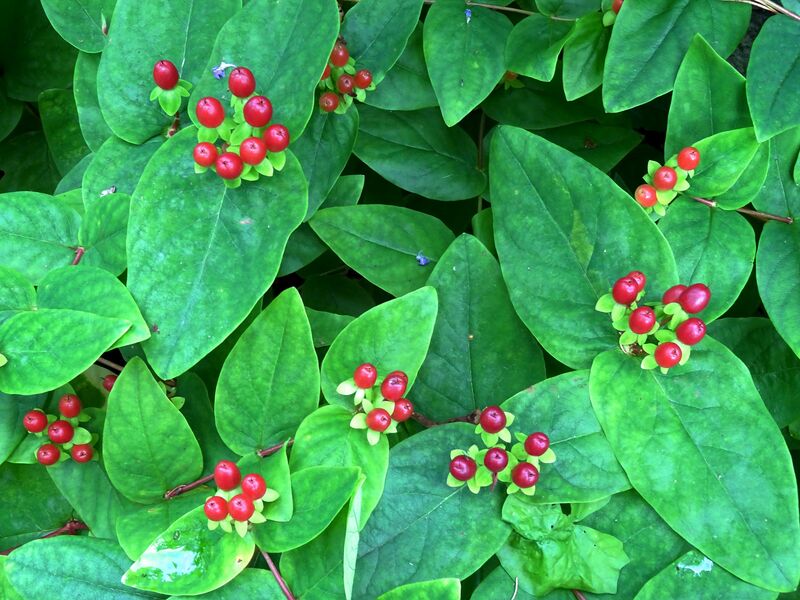 This plant is no trouble so long as you leave its berries alone, which are poisonous. If my children were still young I would be thinking seriously about digging it up too. And then there are the trees. We have a number of large trees in our garden, such as beech and sycamore, which as they grow can create too much shade for other plants to thrive, but for me, they are much easier to manage than the Aquilegias and the Ground Elder. The trees seed themselves too, but it takes a long time for the seeds to get established, long enough to ‘nip them in the bud’. So yesterday, whilst gardening I was thinking about the various approaches I could take to ensure that my garden thrives. I could take a ‘hands off’ approach and leave it all to nature – let the self-seeding plants, rhizomes and trees dominate, take over and ultimately cause the death of many other plants. I’m sure the garden would survive, but what kind of garden would it be and what would happen to the diversity of plants? I’m not sure how attractive or interesting the garden would be as a result of this approach. Or I could spend every waking hour, which is what I think it would take, to make sure every plant is growing exactly where I want it to, when I want it to. I think there is a lot to lose from taking this approach. First it would be a constant battle – nature has to be wooed rather than fought. And then there would be the loss of all those lovely unexpected surprises that a garden can bring. But I think the only answer for me is somewhere in the middle of these two extremes. If I took a ‘hands off’ approach I would question why have a garden at all, when I only have to walk into the nearby countryside to experience the results of letting nature take over. Taking a super-managed approach wouldn’t work for me either. I think it would quickly become boring. I want my garden to be a pleasure, not a chore, but I also want it and the plants in it to survive and thrive. To ensure that they do, I can’t allow a free for all in my garden. It does require some management. In particular I feel that it is my responsibility to manage those dominant, self-seeding plants and rhizomes, otherwise I might as well not have a garden at all. Of course, the little I did in my garden yesterday is far from the whole picture when it comes to creating a beautiful garden. Nurturing plants so that they show us their full potential requires knowledge and expertise. It’s related to getting the balance right between structure and agency which I wrote about in my last post. 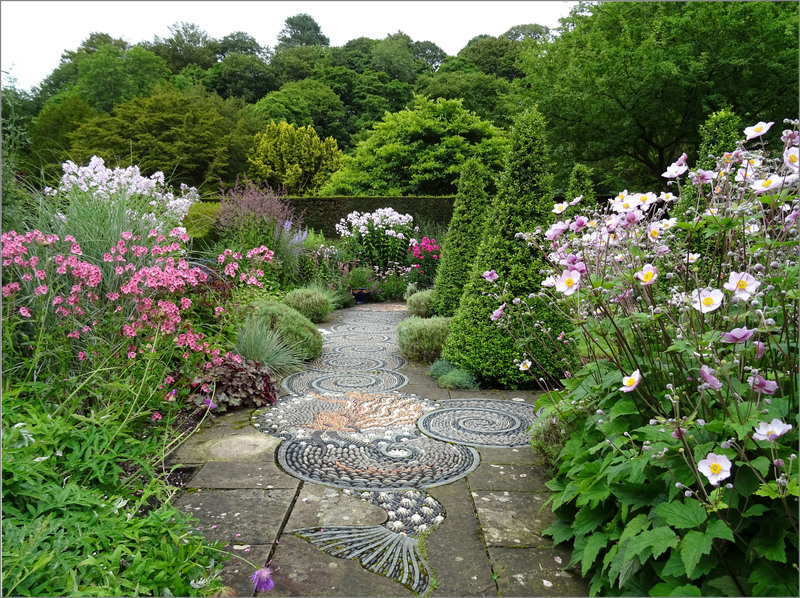 A garden near us that seems to have really achieved this is Gresgarth Hall Gardens. There’s a lot to learn from this beautiful garden. 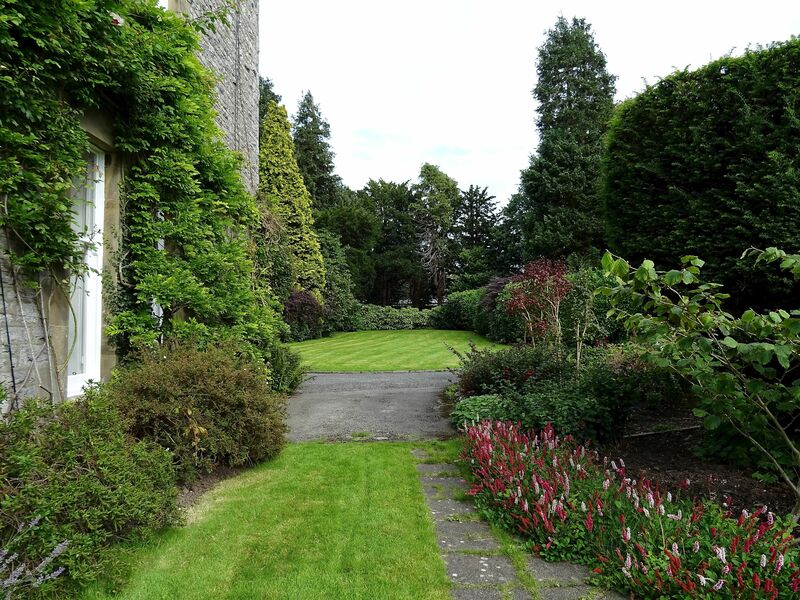 We only have to compare the photo of my garden with the photo of Arabella Lennox-Boyd’s garden, to see that there’s more to gardening than just management.